South Kensington is perhaps the most prolifically developing neighborhood in Philadelphia. The blocks north of Girard Avenue are seeing several new developments, mostly midrise apartment developments with some retail and some townhouses. As those southerly blocks are developed, development is moving further up towards Lehigh Avenue. 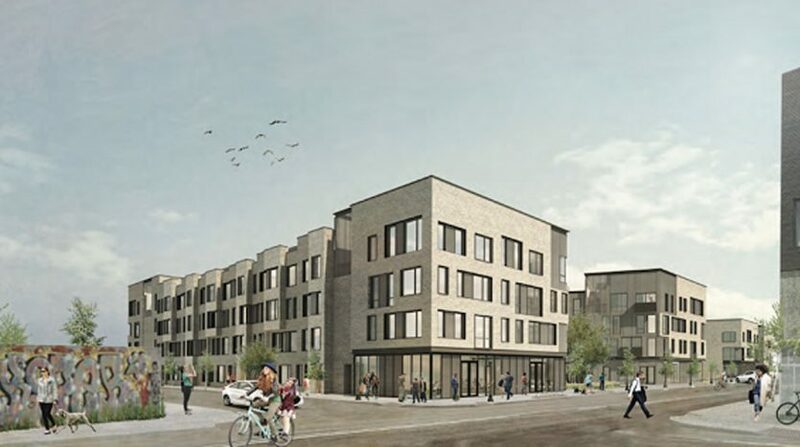 One new development will recreate an industrial block between Germantown Avenue, North 5th Street, and Cecil B. Moore Avenue, a site which is currently used to store pallets. This development is called Avenue V and is being built by Riverwards Group and designed by KJO Architecture. Avenue V will have 147 condominiums for sale and four retail spaces, mostly along 5th Street. The site will be divided into two wedge-shaped sections, separated by a drive aisle to the 49 parking spaces. One half will be referred to as Block A and will have a large courtyard open to Germantown Avenue, known as Courtyard A, with seating, lighting, landscaping, terrace steps, and a lawn. 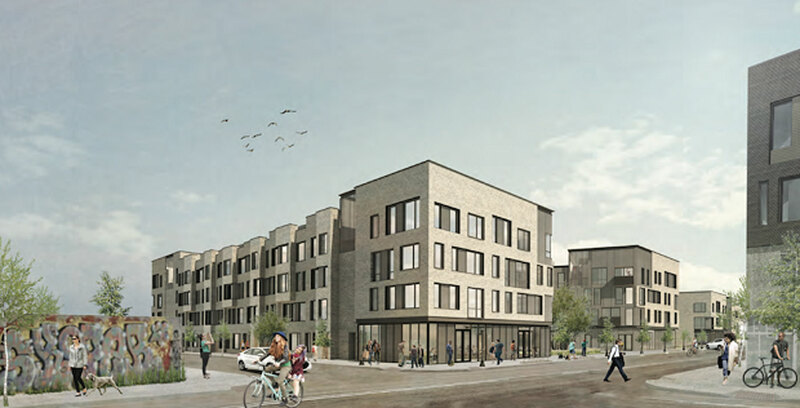 The other section of the development will be referred to as Block V, and will have a courtyard known as Courtyard V, which will be similar but smaller and open to North 5th Street. Both courtyards will have some planned events. The surrounding buildings will be four stories tall and will have green roofs on two thirds. The condos will range from one to three bedroom units and from 700 square feet to 1,100 square feet. Many would have terraces and roof decks. Most of the units will be sold at market rate, but fourteen will be affordable and sold at below market rate. There will be several bike racks and bicycle storage inside. South Kensington will continue to develop with these kinds of residential developments. Just across the street is another similar development on North 5th Street. There are several planned for Second Street, American Street, and Germantown Avenue. Nearby in Northern Liberties, Tower Investments is about to build the last, and largest, phase of The Piazza. Also nearby, at North 5th and Montgomery, the former Stetson Hat Factory is being renovated into The Umbrella Factory Lofts. Avenue V fills in one of the largest spaces in this part of the neighborhood. Interested in exploring housing options in Northern Liberties and South Kensington? Call or text 215.692.6636 or email info@thecondoshops.com.